In multi-functional landscapes, farmers do more than grow food. Farmers rear livestock in the Nordic fjords, effectively operating in an agroecosystem where man and nature are both forces in shaping the landscape. Photo taken by Alberto Bernués. In some of the most biodiverse regions of the world, people have farmed for centuries, shaping magnificent agricultural landscapes. Multifunctionality recognizes agriculture as a multi-output activity producing not only private (market) goods such as food, feed, or fibre, but also public (nonmarket, non-excludable, non-rival) goods such as agricultural landscapes, farmland biodiversity, water quality, or soil functionality. Additionally, multifunctional agriculture sustains rural development, including tourism and recreation, and preserves cultural heritage values such as the production of local high-quality foods linked to the territory. Animal agriculture in fjord and mountainous areas in Nordic countries represents a minor and decreasing contribution to the local economies, which are largely dependent on tourism and other services. However, traditional farming, largely in the form of grazing livestock systems, is essential for maintaining the agricultural landscape, rural heritage and cultural identity, which constitute key assets for the tourism industry. The municipality of Aurland in southwestern Norway (1714 inhabitants) is dominated by mountains that range up to 1800m and fjords, including the Aurlandsfjord and the Nærøyfjord, which are branches of the Sognefjord, the world’s longest and deepest fjord. Cultivated land at the bottom of the valleys is scarce, but in combination with boreal and alpine grasslands it contributes to the maintenance of a highly valued agricultural landscape. In 2012, there were 70 farms, of which 14 had small-scale agricultural production (mostly berries) and 56 were livestock farms keeping 2290 sheep for meat, 1285 dairy goats, and 49 dairy cows. The municipality of Aurland includes two of the major tourist attractions in Norway: the Nærøyfjord and the Flåmbana. Both of these areas are impressive destinations. The Nærøyfjord is noted for its natural splendor, warranting it a designation on the UNESCO World Heritage Site list. Meanwhile the Flåmbana represents a drastic elevation difference from sea to mountain. Here tourists can find a train line, opened in 1940, that—in a brief trajectory of 20 km along the Flåmsdalen—rises to an elevation of 863 m. Nearly 1 million people visit these two sites annually. On the scene, researchers sought to understand the perceptions and value sets placed on the ecological services provided by montane ecosystems. Researchers from the Norwegian University of Life Sciences (NMBU) and the Agrifood Research and Technology Centre (CITA) in Spain used qualitative (socio-cultural) and quantitative (biophysical and economic) methods to obtain an holistic evaluation of the societal value of fjord and mountainous areas in the Nordic countries. The study combined deliberative (interviews to farmers and other local stakeholders) and survey-based stated-preference methods (choice modelling) to achieve two goals: 1) to identify the perceptions of farmers and other local stakeholders on the diverse functions of fjord and montane agriculture and 2) to value these in economic terms according to the willingness of the local (residents of the study area) and general (region where the study area is located) populations to pay for these functions. A similar approach to calculate society’s willingness to pay (WTP) for ecosystem services was applied in a study, conducted by the same team, in a Mediterranean context. As in the past study, the team conducted the research in two stages, although with a different methodology. As an initial step, the diverse functions of agriculture were discussed and rated by farmers and representatives of the tourism industry, governmental agencies, and nonprofit organizations that were involved in the conservation of environmental and cultural heritage. The functions were: control of forest growth, the maintenance of cultural heritage, the continuation of rural life and activity, the preservation of soil fertility, the maintenance of tourist attractions, the conservation of traditional agricultural landscapes, the conservation of biodiversity, and the production of local high-quality foods. Next, the above functions were translated into four ecosystem services defined according to taxonomy established by TEEB (The Economics of Ecosystems and Biodiversity, 2010). 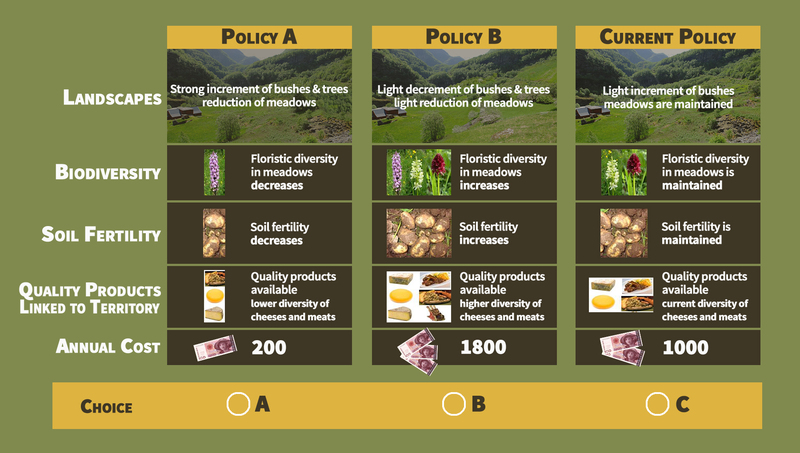 As in the previous study in the Mediterranean, a representative sample of the local and general populations were asked to choose their most preferred level of delivery of the ecosystems services under three policy scenarios. The status quo scenario corresponded to the current delivery of ecosystem services previously identified, whereas the liberalization (reduction of agri-environmental support) and targeted support(additional funding to agri-environmental schemes) scenarios represented different combinations of levels of ecosystem services delivery. While in the Mediterranean the prevention of forest fires was deemed the most important ecosystem service provided by montane agriculture (≈50% of total WTP), in the Nordic countries the preservation of soil fertility acquired great relevance (≈27% of total WTP), as agricultural land is very scarce (3% or total land area in Norway). However, it is worth noting that the other 3 ecosystem services were granted similar values across the two study areas. In the case of Norway, the general population considered the production of quality products (≈28% of total WTP), the conservation of the agricultural landscapes (≈23%) and the conservation of biodiversity (≈22%) to be of comparable importance. Local people, however, demonstrated a greater emphasis to the value of a more human-intervened agricultural landscape (36%) and to the production of local quality products (34%). The same trend was also observed in the local population of the Mediterranean study. 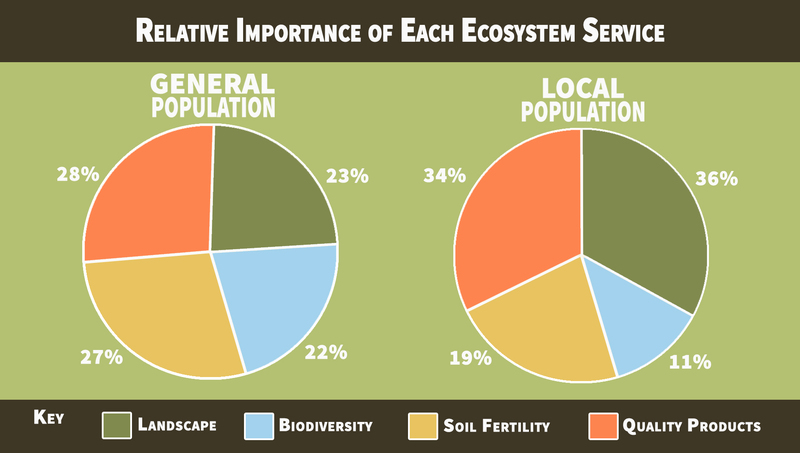 These pie graphs depict the results on how the general and local population considered the relative importance of each ecosystem service delivered by fjord and montane agriculture. Pie graphs provided by Alberto Bernués. From the results of the two studies the authors conclude that there is a clear underestimation of the socio-cultural and economic values of ecosystem services provided by fjord and montane agro-ecosystems. From the results of the two studies the authors conclude that there is a clear underestimation of the socio-cultural and economic values of ecosystem services provided by fjord and montane agro-ecosystems. Therefore, it is essential for sustainability assessments and policy to include both of these themes in their design. They also claim that the welfare loss linked to the further abandonment of farming and the associated environmental degradation is very large in these areas, terrains that constitute clear exponents of High Nature Value farmland and thus hold the greatest biodiversity indexes in Europe. It is therefore necessary to measure the biophysical, socio-cultural, and monetary value of ecosystem services provided by these multifunctional landscapes and compensate farmers in an equitable way for the delivery of public goods. Bernués A., Rodríguez-Ortega T., Alfnes F., Clemetsen M., Eik L.O., 2015. Quantifying the multifunctionality of fjord and montane agriculture by means of sociocultural and economic valuation of ecosystem services. Land Use Policy 48, 170-178. Bernués A., Rodríguez-Ortega T., Ripoll-Bosch R., Alfnes R., 2014. Socio-cultural and economic valuation of ecosystem services provided by Mediterranean montane agroecosystems. PLoS ONE 9(7): e102479. Dr. Alberto Bernués is a researcher at the Agrifood Research and Technology Centre (CITA) in Spain. His work has made valuable contributions in the fields of animal agriculture, systems analysis, sustainability assessments, decision support systems, and consumer quality perception. Originally posted on Landscapes for People, Food and Nature.